Imagine you could inject a special, electrically conductive fluid into a rose, which then spreads out through the plant and grows into it. Imagine creating an entire garden or forest of cyborg plants that act as a gigantic, biological computer network. Well, imagine no more – scientists from Sweden’s Linköping University have successfully managed to perform the former, while looking forward to the latter in the future. 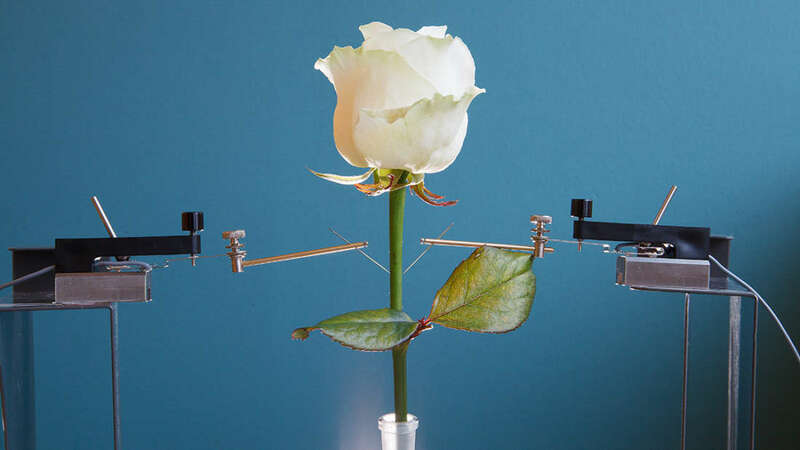 As reported in the Proceedings of the National Academy of Sciences, a rose’s “veins” – its xylem – were filled with ETE-S, a conductive solution that spontaneously forms “wires” through its stems, leaves, and petals. The rose’s own biochemical processes act as the catalyst for the proliferation of the gel, with no external stimulus required. This circuitry integrates itself between the cell walls and the plasma membranes, all without disrupting the normal biological workings of the plant. A very basic version of this was achieved by the same team in 2015. However, back then, the fluid, PEDOT, did not spread autonomously, and it had to be woven into place by hand – a tricky procedure, to be sure. This time around, the conductive network had completely embedded itself within the rose in just two days all by itself. 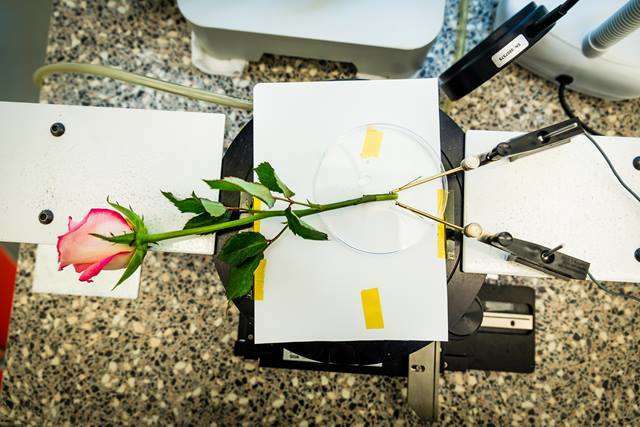 By placing gold electrodes into the rose, the team managed to create a fully functioning transistor. The plant tissue itself is such a good insulator that at no point did the circuit short itself out. Just like a conventional capacitor or transistor forms part of an electronic system within a computer, this e-Plant will form a similar component in a biological-technological hybrid system. Entire new forms of sensors and circuitry could be built out of this type of cyborg vegetation. It may be difficult to think of a use for circuitry that grows organically at the moment, but it presents us with an incredible new canvas with which to transform the world in ways we can yet only begin to imagine. Admittedly, this cyborg rose is a cutting of one, meaning it was dying or dead by the time the circuitry had permeated through it. The next step, the team note, will be to attempt to infuse a living rose with ETE-S and see if it remains alive afterwards. If this is shown to work, then prepare yourself for a future where you can essentially plant computers in your backyard.